VI is a screen-oriented text editor created for UNIX operating system originally. It was created by Bram Moolenaar in 1991 and released under the license that includes some charityware clauses encouraging the users to help the poor children of Uganda. It is basically the enhanced version of Vi Editor. Vim stands for Vi improved. In this tutorial, we will install VI Editor on CentOS. Type vim on the Terminal to check whether vim is already installed on CentOS or not. 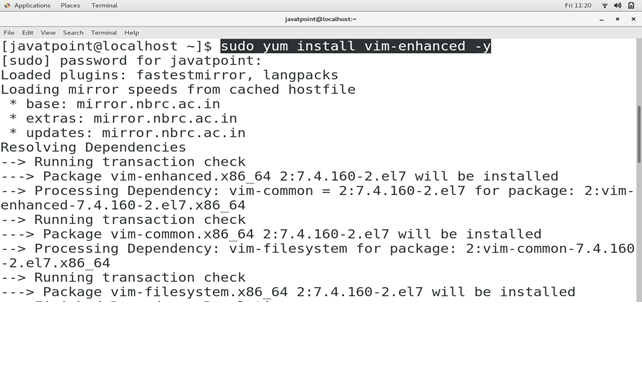 Run the following command to install vim on CentOS. Just type vim on the terminal to check whether it is correctly installed on the system or not. Hence, we have successfully installed and get started with VIM.